1. Fountain Pen – A fountain pen is an elegant and traditional choice that will stand out in today’s digital world. While fountain pens can span a tremendous range of price points, consider this offering from Waterman at $85. I have personally used Waterman fountain pens and enjoy writing with them. Keep in mind that writing with a fountain pen may take some getting used to if you are only familiar with ball points. 2. Gavel Set – A personalized gavel set makes an excellent decorative addition to a lawyer’s office. If you look around online, there are various sellers who offer customized gavel sets, such as this one. 3. Portfolio – Lawyers often value a nice folder to organize their papers or hold their notepad during important meetings. Try this Etsy search for a variety of options from different vendors with various possibilities for customization. 4. Lawyerly Art Prints – What about a framed piece of law-inspired art? Art.com has a whole category of art for lawyers, including both traditional legal scenes and more humorous selections, like this New Yorker cartoon. 5. L is for Law – This one is no surprise for readers of this blog. 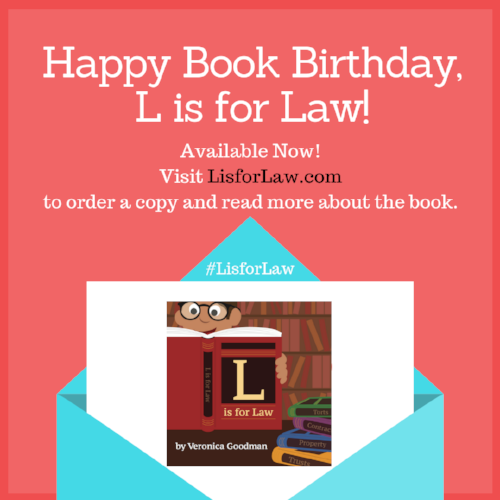 Consider giving a copy of L is for Law to all your lawyer friends with toddlers! We know a lot of lawyers with children of all ages, which is part of the inspiration behind L is for Law, so I’m always on the look out for baby shower and baby gift ideas for them. Here are a few of my go-to gifts and other ones that I’ve bookmarked. This plastic gavel is perfect for babies and toddlers who love to object to everything their lawyerly parents might ask of them. I Dissent is a great biography of Ruth Bader Ginsburg by a local author, Debbie Levy, here in Washington, D.C.
For older kids 5 and up, this 3D puzzle of Independence Hall in Philadelphia can be a good conversation starter about the history of our democracy and the Constitution and a great activity for the whole family to enjoy together for some screen-free time. This new release, Turning Pages, by Justice Sonia Sotomayor is a testament to the power of books and an inspiring life story. This picture book autobiography is also available in Spanish. And for the littlest preschool lawyers, please don’t forget about my book, L is for Law, which should keep babies engaged and lawyer parents entertained. Alysson Bourque featured L is for Law and E is for Economics on this week's segment, Kid's Lit Picks, with Jazmin Thibodeaux News15. The segment is here. L is for Law Out Today! L is for Law is officially out today! It's a fun, colorful alphabet book for preschool-age children (or for actual lawyers who need to brush up on their ABCs). The book features a new legal term for every letter of the alphabet, illustrated by full-color, playful images to entertain parents and children alike as you move from A to Z. And if you know any baby lawyers or lawyerly parents who would appreciate the book -- and I know you know A LOT of lawyers -- please spread the word. And if you happen to order a copy and enjoy the book, please leave a review! Special thanks to Nicole Jones Sturk, the talented illustrator of the book. Sunday’s review: L IS FOR LAW by @vwgoodman, illus. by @nikijin! One of my favorite kidlit reviewers, The Baby Bookworm, wrote a comprehensive, honest review of L is for Law. I'm so happy to hear that they enjoyed it! "Hello, friends! Our book today is L Is For Law, written by Veronica Goodman and illustrated by Nicole Jones Sturk, an alphabet book for aspiring esquires. Following the same format as its prequel, E Is For Economics, little readers are introduced to various concepts and terms from the legal world: A is for Attorney, B is for Bar Exam, C is for Class Action, and so on. Each letter and term is accompanied by a tongue-in-cheek illustration that interprets the definition of the term in either a literal or comedic way." Thank you to Legal Cheek for this delightful review of L is for Law! "When it comes to children’s books, you won’t find many (or any at all) gracing the shelves of your law school library. Enter L is for Law — a new picture book aimed at demystifying legal concepts for kids." Read the entire review by Aishah Hussain here. I dropped off signed copies of L is for Law at Politics and Prose this morning ahead of the release in less than two weeks! Here is a before and after of one of my favorite pages by the talented Nicole Jones Sturk. Do you see any differences? Book Trailer and L is for Law Announcement!